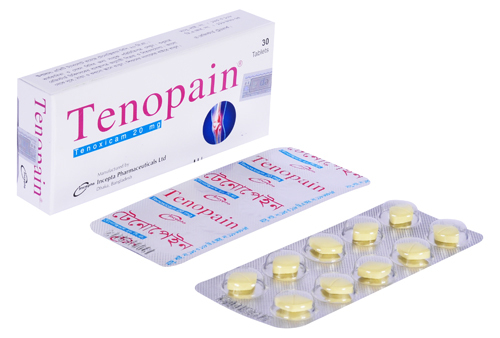 Tenopain: Each film coated tablet contains Tenoxicam BP 20 mg.
Tenoxicam is a non-steroidal anti-inflammatory agent with analgesic and antipyretic properties. Tenoxicam is a potent inhibitor of prostaglandin synthesis by blocking the enzyme cyclo-oxygenase. Additional actions contributing to its anti-inflammatory effect includes inhibition of leukocyte functions including phagocytosis and chemotaxis and scavenging free O2 radicals. For the symptomatic treatment of rheumatoid arthritis, osteoarthritis, ankylosing spondylitis and extra-articular inflammations such as tendonitis, bursitis and periarthritis of the shoulders or hips. Tenoxicam should be taken with food. Adults: The recommended daily dose is 20 mg taken at the same time each day. Tenoxicam 20 mg tablets should only be used for up to a maximum of 2 weeks in cases of severe acute musculoskeletal disorders. Usually treatment up to 7 days is sufficient. Children: Tenoxicam should not be used in children less than 16 years of age. The most common adverse effects include peptic ulceration, dyspepsia, nausea, constipation, abdominal pain, diarrhoea, rash, headache, edema, renal failure, vertigo etc. Caution is required if administered to patients suffering from or with a previous history of bronchial asthma since NSAIDs have been reported to cause bronchospasm in such patients. Appropriate monitoring and advice are required for patients with a history of hypertension and/or mild to moderate congestive heart failure as fluid retention and edema have been reported in association with NSAID therapy. When GI bleeding or ulceration occurs in patients receiving Tenoxicam, the treatment should be withdrawn. During the first and second trimester of pregnancy, tenoxicam should not be given unless clearly necessary. Tenoxicam is contraindicated during the third trimester of pregnancy. In the limited studies so far available, NSAIDs can appear in breast milk in very low concentrations. If possible, NSAIDs should be avoided when breast-feeding.